I’ll admit it—I may have semi-cheated on this gingerbread house. My mom (whose birthday falls on the 31st, making her a huge Halloween fan as well) bought me a “DIY Halloween gingerbread kit” with the gingerbread pieces premade. If you’re short on time or wary of cutting and baking gingerbread pieces yourself, I’d recommend this prefab option. Otherwise, take a gander at my favorite homemade gingerbread recipe HERE. Now for the fun part—decorating! 1. First, make your frosting. Lightly whip together 4 egg whites until frothy. Gradually add 7 c. sifted powdered sugar. Add 2 TB lemon juice and mix on medium for 2-3 minutes until smooth. Your frosting should be the consistency of toothpaste—if it’s too thick, add one or two teaspoons of lemon juice. If it’s too thin, add several tablespoons of powdered sugar. Divide your frosting into 3 air tight Tupperware containers. Now is a good time to add your frosting coloring—I used Wilton’s gel icing colors in Moss Green, Orange (Red-Red plus Lemon Yellow), and Black. Mix each frosting to your desired color and seal tightly in the Tupperware (your frosting will harden very quickly if left without a cover). 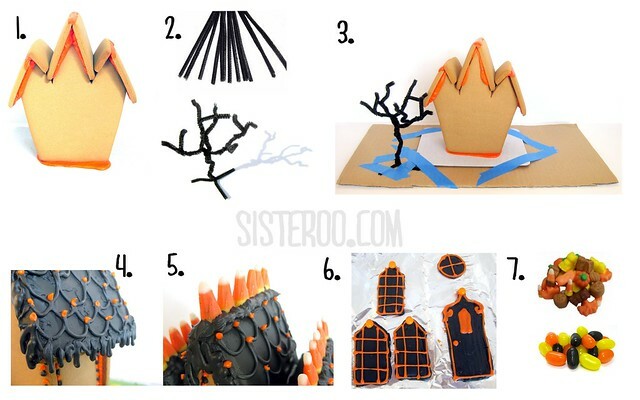 Assemble your house by piping orange frosting on the edges of your house pieces (I did this using a #6 round tip). Let dry at least 30 minutes. 2. While your house is drying, make some trees for your yard. I used 4 black chenille pipe cleaners and created a tree by braiding 3 pipe cleaners together for the trunk and then using the excess pipe cleaners as branches. I used balled up tissue paper, sandwich ties and a sharpie marker to create hanging tree ghosts (this was husband’s idea—thank you, husband!). 3. Mount your house and landscaping tree(s) on a large piece of cardboard. I used blue painter’s tape because I knew the base would eventually be covered with frosting. …Speaking of which—time to frost your base! I started by evenly spreading a medium layer of green frosting across the entire base, making sure to cover any tape. Immediately after spreading, I used my spreading knife to create a grass effect by pushing the knife into the frosting and then drawing it up. The frosting is fairly stiff and should create stiff, grass-like peaks. 4. Next, frost your roof using a thin layer of black frosting. While it’s drying, fill a decorating bag with the remaining black frosting. Using a #2 tip, decorate the roof with a scalloping and icicle effect. This is supposed to be a spooky house, so don’t worry about getting it just right! The wonkier the better. 5. Using your #2 tip, pipe a line of frosting across the top of the roof. Immediately place a line of candy corns (or other Halloween candy) in the frosting. You may need to steady the candy as it dries. 6. Window and door time! It’s always easiest if you pipe your windows and doors onto a piece of wax paper and affix them to your house once they’ve dried. I made a few pieces here using the #2 tip for my black frosting and a #1 tip for my orange frosting outlines. Let dry for at least an hour or until completely firm. Affix to your house with a few globs of frosting. 7. Time to decorate…use any fun Halloween candies to trim your house. I went for a jelly bean border around the house, some sixlet detailing, and candy corn pumpkin patches in the yard. 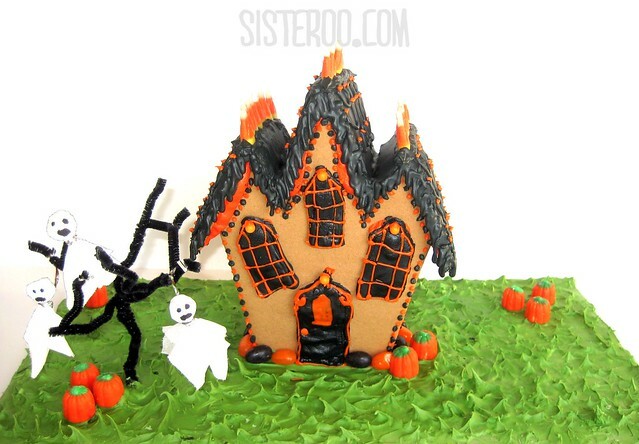 Good luck Halloween house-ing, Sisteroos! Lawyer, you are brilliant! And your husband's ideas are just fantastic! I really like the windows and candycorn roof. Super pretty!!! !